We strive to keep you informed of the latest information maintaining your ocular health and well being. While checking everyone for glaucoma we always use the gold standard of testing, the Goldman tonometer. We find many patients are thrilled not to have to experience the “puff of air”. One has said this is a “puff-free zone”! 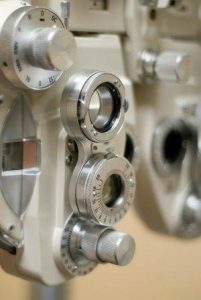 Our testing of the field of vision also exclusively utilizes the gold standard of the Humphrey Visual Field instrumentation. We routinely evaluate your cornea for dry eyes or corneal changes and diseases by using our state-of-the-art corneal topographer. We routinely monitor the layers of the central retina with a spectral domain analysis using the OCT. This is important with Diabetes, Macular Degeneration and even Multiple Sclerosis and many medicines taken orally. By using this we have many digital images to monitor the improvements with your dry eye. It is also crucial in managing keratoconus, irregular shaped eyes and LASIK. Optovue, an innovator in spectral-domain optical coherence tomography (SD-OCT), is a intergral part of our new wellness program. The WellnessExam has been added by the introduction of new spectral OCT from Optovue – the RTVue. The incorporation of the new Wellness exam, which scans for both retinal and glaucomatous pathology, will complement the everyday comprehensive eye exam. This is a digital exam of the Ganglion Cell Complex and Retinal Nerve Fiber Layer. The program evaluates your individual retinal complex, compares it to their huge data base, and adjusts for the patient’s age. The summary of findings are printed out. This is an annual recommended evaluation as a part of persuing wellness. Changes of the eye are easily found by the annual comparison. Recommendations are then given. The diagnostic capabilities of the practice will be greatly enhanced with the implementation of the Wellness program. The WellnessExam is non-invasive and can be performed quickly and easily as an initial step in a routine comprehensive eye exam. Wellness images provide a cross sectional view of the retinal layers with 5 micron resolution. In addition to the cross sectional views, the WellnessExam provides a retinal thickness map and a ganglion cell complex map. These outputs assist the doctor in identifying very early signs of disease, or confirm the patient’s ocular health.Early detection of retinal abnormalities and disease may lead to earlier and safer treatments and in many cases, prevent or slow vision loss. The Basic Wellness exam is recommended annually along with dilation regardless of symptoms, giving a thorough exam possible. The Enhanced Corneal Wellness exam with the topography evaluation is recommended for all dry eye patients, and anyone who “has not been able to get good vision with correction”. The Enhanced Glaucoma Wellness exam with digital peripheral testing is recommended for everyone 65 and over, people concerned about glaucoma, and athletes playing contact sports. The Premier Wellness exam incorporates all aspects of the above. This is the most in-depth assessment. We will be confident all facets of your vision have been addressed. This is the recommended package if you have not been keeping up with your annual examinations.